Right over the Bourne Bridge on Cape Cod, Carousel Stained Glass is a studio that creates stained glass, mosaic, & fused dichroic pieces for sale as well as instructs in the art of stained glass. 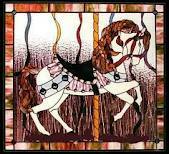 Since 1988 Rhonda Messier, Owner of Carousel Stained Glass, has been creating and repairing custom works of glass art for the South Shore and Cape Cod. Interested in taking a class click here for more information. We also do stained glass repair. Again welcome and I hope to work with or for you in the future in sharing the art of glass.